Far be it from me to criticize the masters, but something has been bugging me about Charles Dickens for the past several years and it's time to talk about it. 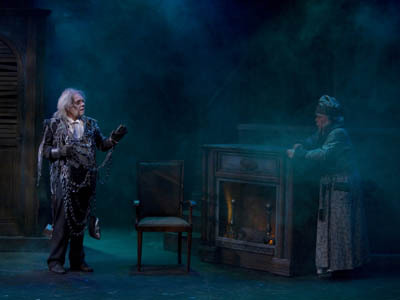 For the fifth year, I reviewed Dickens' A Christmas Carol again this weekend and each time I see it I wonder how this passed the censors. I even went back to the original text to make sure that it wasn't just the playwright who goofed. You�ll want all day to-morrow, I suppose?� said Scrooge. Got that? It's Christmas Eve, Scrooge has given Cratchitt the next day off and tells him to be in early the following day. �Expect the second on the next night at the same hour. The third upon the next night when the last stroke of Twelve has ceased to vibrate. Now, by Scrooge's conversation with Bob Cratchitt, Marley's visit occurs on Christmas Eve and he predicts that one spirit will visit Scrooge tomorrow and the next two spirits over the next two days. When the last spirit has left, Scrooge wakes up and it's Christmas morning. Now, I can accept that the spirits work their magic and that They can erase the three days which have elapsed and return Scrooge to the morning of Christmas day, but what did the old man do in the days between visits by spirits? Did he go to work? Was he still mean to Cratchitt? Are we to believe that he slept the clock around for each of the 3 days until the next spirit comes? Fallacy somewhere, I fancy. Or have I just been watching too many detective stories on television? How can I get these pressing questions answered when the author of the work has been dead for more than 130 years? Where is Kathryn Morris (of Cold Case) when I need her? While my nagging worry about A Christmas Carol remains, there are no such nagging questions about the other beloved Christmas play, A Christmas Story, which I reviewed on Sunday. The play based on the stories of Jean Shepherd (and adapted by Philip Grecian) may not be as timeless as A Christmas Carol, at least you won't find any discrepancies in the plot and it returns all of us who grew up in the 50s to that time when life seemed so much more simple and uncomplicated. I think I've finished the last of my holiday shows. I've seen three now and I've written two articles about the Davis Children's Nutcracker. For me, I think that my official Christmas duties have now come to an end.